Bayside Sunset is the perfect spot to have a Lake Michigan Vacation, directly across from Old Mission Peninsula. The property is wooded; sandy beach and countless perennial gardens. This classy comfortable, spotless home is situated in a beautiful spot on the east side (called East Bay) of lake Michigan. Lakeshore Road is a wooded, tranquil neighborhood, dead-ending into a private road leading you into a two-tract (no cars are allowed). Here you can walk safely onto South Bay Shore Road or walk the beach into the Elk Rapids Village for fun shopping. The Elk Rapids area is an upscale resort offering many wonderful amenities. This home is truly one of a kind—with a five-star rating. The home was built in 2000 with the vision of building a lakefront cottage emphasizing the charm of a 1900’s gathering place for the owner’s family. This 3,600 sq. ft. home is a cozy, intimate, peaceful setting with a classic touch of beauty displayed in each room. The house is GORGEOUS! The three queen size beds, two double beds and bunk beds accommodates twelve people. 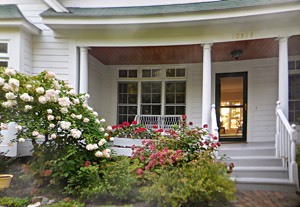 The house welcomes you the minute you pull into the driveway, past its beautiful flower gardens, trimmed lawn and majestic trees. When you walk in the front door, you know you selected the perfect vacation home. It has expansive views of the bay. You will enjoy the incredible sunsets! Looking towards Old Mission Peninsula the sunset dramatically displays blazing color of orange, red and pink over the lake’s horizon. In all of this glory the sunset disappears leaving a sky full of stars to be enjoyed. Enjoy the patio surrounded by gardens, while barbecuing your favorite meal on the grill, as the children play in the sand and water. There are no nasty weeds, only the sugar sandy beach to enjoy. Your rental house is five miles to the Great Lakes Equestrian Festival at Flintfields Horse Park. This location is perfect for fishing, boating, tubing, skiing or just sitting in that comfortable beach chair with your feet at the water’s edge, reading your favorite book that you never have time for. Elk Rapids Village has an outstanding museum; several golf courses are nearby; take a short walk into the quaint village to see antique shops, art galleries, our marina was voted #1 in the State of MI; casinos and Traverse City is 20 miles away. Please see baysidesunset.com for calendar, rental rates, pictures, etc.